It's Meat, Meat, Cheese and Meat! 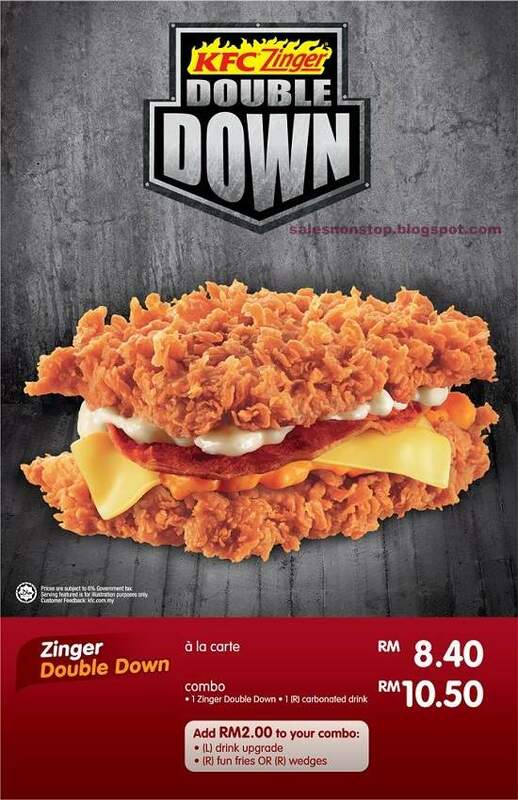 Latest product offering from KFC, The Double Down is a sandwich contains "bacon, two different kinds of melted cheese, the Colonel’s secret sauce... pinched in between two pieces of Zinger patty". Are you man enough to down this all-meat, bunless burger? Prices subject to 6% Government tax where applicable. Servings featured are for illustration purposes only. Prices applicable in Klang Valley outlets only. Combo and price may vary according to location. Should any discrepancy occur in published price, the pricing at restaurant point of purchase is deemed final. Promotion is valid while stocks last. Do you like KFC Zinger Double Down?